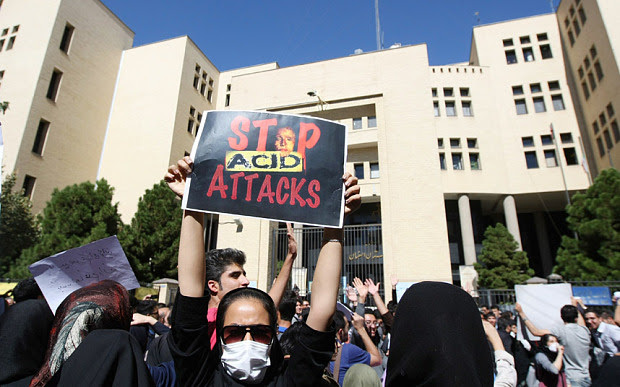 A senior Iranian official has claimed that the recent spate of acid attacks on women in the country “is the work of foreign agents,” whom he accused of seeking to undermine the stability of the Islamic republic. At least eight women have had acid thrown in their faces this month in the city of Isfahan, a Unesco world heritage site 200 miles south of Tehran. Some local reports say as many as 20 have been attacked. In the weeks before the attacks began, clerics railed against the wickedness of “bad hijab” — lax adherence to the formal dress code — by women, and the victims are thought to have been targeted for being seen in “immodest dress”. But Javad Larijani, the human rights secretary at Iran’s ministry of justice, told the Tasnim news agency that it was not the work of hardline conservatives, but rather that of “foreign agents”. Another disadvantage of touchy Muslims immigrants: if anything happens to them, they are sure it is a filthy plot. No doubt they think Soltan was murdered by the CIA or MI6 or Zionists — or possibly a conspiracy involving all three. The same group are no doubt behind the acid attacks. Never admit all cases could lunatic psychopaths. The Islamic Republic surely has no psychopaths.